As I recover from the pregnancy and delivery of my third (adorable) child, I find the process slow but sure. Each time it seems to take a little bit longer, but I’m certain there is a new normal in sight. I love that I get to share this phase with many friends and fellow mothers who are going through the same things that I am. I feel so lucky that we get to lean on each other and help each other through all of the highs and lows, learning from each other along the way! One topic I find that I’m consistently sharing on is how to close the diastasis recti gap. With some help and advice from my sister in law (a personal trainer certified in postnatal fitness), I was able to close the gap after my second pregnancy and in turn, get into the best shape of my life. Now it’s time to pay it forward!! Diastasis recti is a separation of the abs that commonly occurs with pregnancy; most likely to occur after multiple pregnancies and pregnancies of multiples (but that doesn’t mean you can’t get it after just one). A majority of moms have diastasis recti a few months postpartum, and roughly 1/3 of women who have given birth will still have diastasis recti at a year postpartum. It is a major contributor to “the mom pooch”. Lay down flat on your back, with your knees up and feet on the floor. Do a small crunch and use your finger tips to feel for a gap above your belly button. You can check your entire torso for the separation; a gap of more than 2 finger tips wide indicates you do have it, and will require physical therapy to close, with some rare cases requiring surgery. Why should I close it? Don’t be fooled; closing the gap is a good idea for many reasons, not just to avoid a mom pooch (though that’s a perk for sure!). For one, a very wide gap can leave many organs vulnerable as they aren’t as protected by your muscles. Another important note to remember is that the separation equals a weak core and pelvic floor. This can lead to any number of issues with posture, back pain, incontinence, etc. In my own experience, correcting diastasis recti and strengthening that inner core made my regular work outs even more productive. I ran faster, I felt stronger, and I was less sore. My core was stronger, so I also experienced far less back pain if I held my children for extended periods of time. It’s easier to start early, but never too late to start!! Correcting diastasis recti is a slow but worthwhile process. The first thing I would suggest is looking up Lindsay Brin. She is the master of this topic! From there you can glean great information and workouts to close the gap and improve overall postpartum fitness. THIS Lindsay Brin video for 3 weeks, no other work outs. I then add some of her other videos with low impact workouts. I DO NOT do lunges, squats, planks, push ups, crunches or sit ups until the gap is closed (or less than 2 finger tips). I DO keep my core tight and pulled in while doing other workouts, making sure I’m not pushing my abs OUT. I DO NOT run or do any other higher impact workout until my gap is at 2 finger tips or less. When I do any type of workout or heavy lifting (picking up my children, included), I check my belly button. Pulling it in and up and standing up straight engages the inner core and prevents me from pushing those ab muscles out and apart, essentially undoing all my hard work. Any time I feel that my core needs a tune up, I come back to that first video. Those small movements make a big difference! Patience. Patience with the process and what I want my body to do. Listening to how I feel when doing the workouts. This is so hard! Getting the green light to work out at 6 weeks postpartum but waiting until 8-10 weeks to go for a much desired run is SO HARD for me.. but I’m better and stronger for waiting. I hope this helps you as much as it has helped me. Let’s get STRONG, mama! 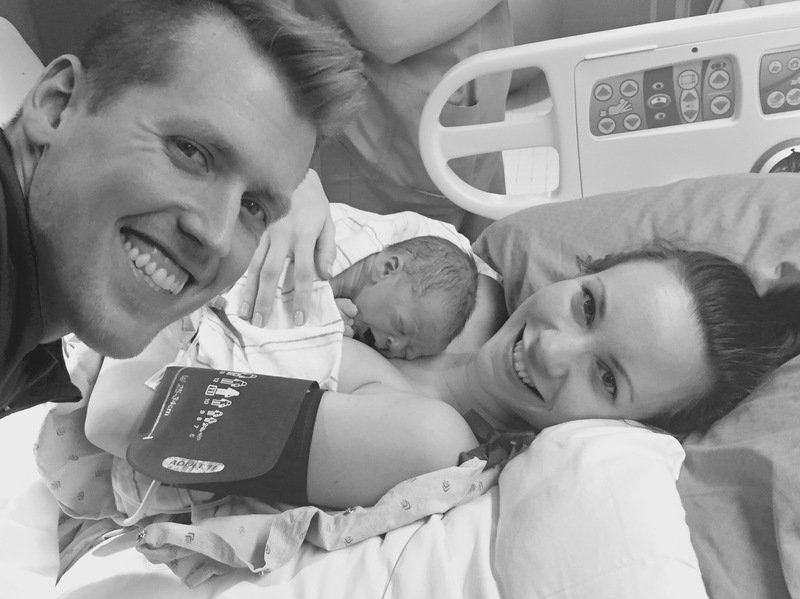 You may have read our son’s birth story a few posts back (check out the link if you haven’t! ); but the story isn’t over. As it turns out, my husband is the gutsiest person you could ever meet. And I, the most amazing wife. We were sitting in triage, awaiting the midwife to check my dilation and decide whether or not to send us home. My husband was killing time on social media. As he’s scrolling through Facebook, he notices a post in our neighborhood group about a dog that needs to be rehomed. As an added bonus, it happens to be a purebread Doberman puppy (with papers) and the rehoming fee was minimal. He began to converse with the people rehoming the dog and is quickly smitten with the idea of adopting the fur baby. He, being the wise man that he is, tells me all about what he has found and expresses his desire to adopt this puppy; in between my contractions, of course. OH WAIT. Did we forget about that already?! Yes. This conversation is happening WHILE I’m in labor. I sincerely wish I was kidding. I still can’t believe this was even a conversation. As the waves of excruciating pain come and go, I communicate that he has obviously lost his mind since we are having our second child that very day, and will have a newborn and a toddler at home within another two days. He argues that our current dog will need a playmate, and wouldn’t it be great if each of our kids had their own dog? Along with making a few death threats, I warn him to drop the subject and focus on the task at hand. So of course he heeds my warning and starts suggesting names for the dog. If looks could kill, the ones I was giving him would kill a cat. All nine times. Then the bartering begins. He tells me I can have anything I want. I won’t lie- this intrigues me. Permission to manipulate? Might as well explore the possibilities. Then again… I would still have to let him get the dang dog. I am now in the late stages of labor, and he’s still talking about it, despite my terrifyingly harsh and descriptive demands that he stop. I yell for his attention and assistance in coping through labor, and he shows me a video of the dog playing. Oh? What’s this? They just want her to go to a good home so they’re waving the rehoming fee? Lovely. We are now within minutes of it being time to push. The anticipation is high and my body is tense; we are ready to have this baby!! He interrupts- “Hey babe? I just need to let you know that they need an answer by tonight, and that we would need to bring her home by the end of the week”. (This is at 6:30pm. So yeah… We’ll come up with a decision as our baby slides out of my body. No big deal). The visions I had of what I wanted to do to him at that moment… Are violent. I decided to let him get the dog. Call it crazy. It is. We brought her home the day after we brought our son home. To be totally honest, I absolutely loved her. She was the sweetest dog you’ll ever meet and would have been a great fit for our family; but only if the timing was different. Unfortunately we had to find a different family for her within four days. It was quickly realized by all that the training the puppy still needed took far too much time away from our newborn son (we all know the newborn stage goes by quickest of all), she was relatively terrified of our toddler, her care wasn’t practical with hubby’s work schedule; and ironically our current dog TOLERATED the pup, at best. Not exactly the playmate we thought she wanted- turns out we’re the only pack she needs. Moral of the story? Don’t question your wife on ANYTHING while she’s in labor, and don’t adopt a dog the same week you bring home your newborn.